Students will watch a video called "The Day the Mesozoic Died". If you were gone, watch it here (33 minutes, scroll down once the site opens). Honors students: The MESPOWs are #73, #56, and #117. Freshmen and seniors do not have school today due to CRT and ACT testing for sophomores and juniors. Students will do an activity to help them understand the rock cycle. If you were gone, carefully read pages 67-69 (honors pages 52-54), get a copy of the handout, and go through at this Rock Cycle Presentation Complete the handout. Benson is scheduled for jury duty, so he will may be gone today. However, trials are often cancelled, so he may end up being here. Students will do a worksheet - Principles of Geology. Scroll down and select "Older Post" to see last week's post. Periods 1-4-7: Your optional "replacement assignment" for March is 1-22 on page 303. It is due on March 23. It will replace your lowest non-test score. Also, remember that after every test, you have a week to come in and make corrections before school, at lunch, or after school. Benson will have a sub today. Students will watch a video. Students will take notes as Benson explains weathering and erosion. If you were gone, it is important that you read chapter 5 in your text (Honors - chapter 4), and watch this animation - 5 parts. Students will be listening to a guest speaker in the Little Theater. 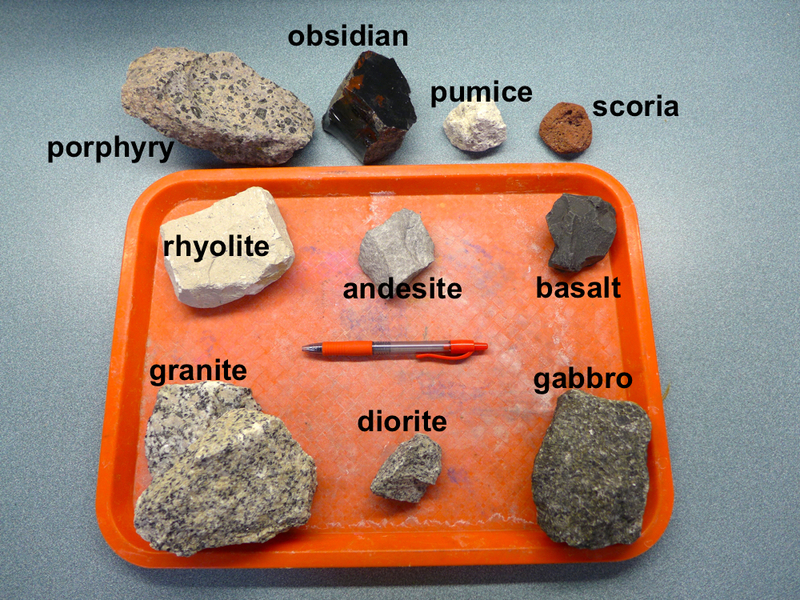 We will review several topics covered last week, and then spend some time examining various types of igneous rocks. We will return and go over several recent assignments/labs, and review for the test (Kahoot). A study guide will be provided. The photo below may be helpful in preparing for the test. This is the KHOOT that we played in class today. Students will take a test. Period 1-4-7 students will take notes. Honors students will have the period to work on their Science Circus Projects. Question of the Week: Crown Butte is made of an igneous rock called "porphyry". Explain how this rock formed.